Take your iPad, turn it into a slap bracelet and you’ve got Wove, the first computer that can roll up and wrap around your wrist. Wove is the first product from flexible electronics company Polyera . It functions a lot like a smartwatch, but with the added ability to curve and bend. It’s also one of the first bendable touchscreen displays with a kind of technology that, if it catches on in the market, could open up new ways to make electronics that can flex like paper without damaging the display. Phil Inagaki co-founded Polyera about 10 years ago, but came up with the Wove about two and a half years ago. The band is made possible by Polyera’s patented digital fabric technology, a proprietary flexible electronics platform the company has been using to develop flexible transistors and displays since the company’s beginnings. Owners can program which applications and information shows up on the device and can read notifications day or night with a 1040 pixel by 200 pixel, multi-touch screen display that uses E-ink technology similar to Kindle. That means owners of the Wove can use and run several applications on the band’s display at the same time. 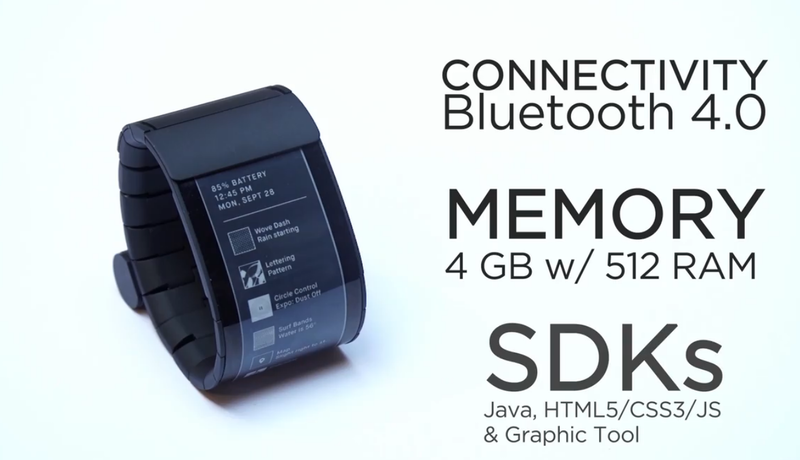 The Wove operating system, Wove OS, connects to your smartphone over Bluetooth and is based on Android’s operating system. Polyera opened up Wove OS to allow developers to begin creating applications for the device before the first prototype hits the market this December. However, the first edition is slated to go out to consumers in mid-2016, according to Inagaki. Polyera is also working with some bigger application makers to develop apps on the Wove OS platform. “We’re trying to open up a very different kind of platform around low-power, persistent, large display on the body,” Inagaki told TechCrunch in an on-camera interview about Wove. Polyera has yet to set the price for this band, but we’re told the cost will be below the least-expensive Apple Watch option. 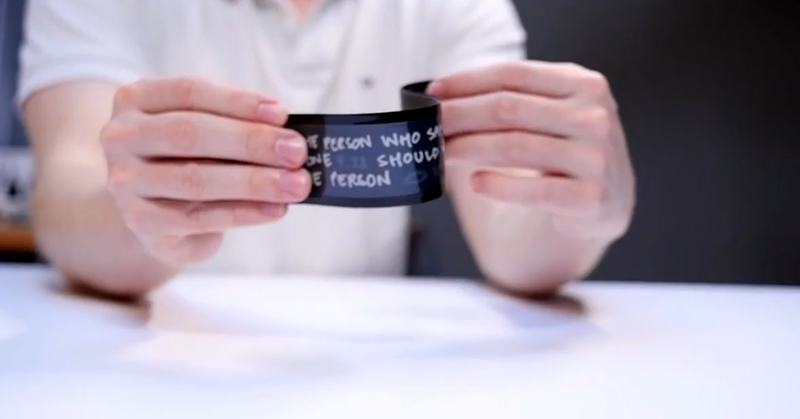 The world’s first bendable wearable is definitely something you have to see with your own eyes. I interviewed Inagaki and got a chance to see how it works for myself and make a video to show you what Wove can do. So stop reading about it and click on the video above to check it out for yourself.